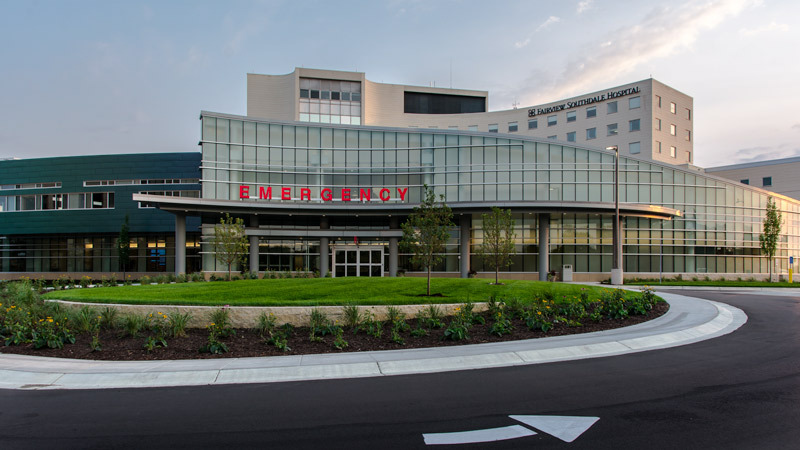 Featured as a Finance & Commerce Top Project, the Fairview Southdale Emergency Center project expanded the ER to more than double its original size to improve the overall experience of its patients. The newly renovated emergency center now features 42 patient rooms, each twice the size of the former patient rooms, and has the ability to serve more than 70,000 visits a year. Working with Knutson Construction, HGA Architects, and the Fairview Southdale Hospital project team to achieve the look that was desired for the exterior of the building, MG McGrath’s Architectural Surfaces team installed 18,000 square feet of Dow Thermax insulation, Z-furring, and Hat Channel behind Dri-Design metal paneling, as well as custom .125 Clear anodized trim around the windows at the panels. The Dri-Design metal panels vary from three different sizes and are West Pewter Mica (12,000 square feet) and English Garden (6,000 square feet) in color, all with a Kynar finish. The English Garden panels provide a dynamic look for the exterior, shifting in color as you move around the building. On the building’s two entry canopies, MG McGrath installed 3,200 square feet of Alucobond 4mm Aluminum Composite soffit panels in West Pewter Mica with a Kynar finish, radiused and welded together. MG McGrath also fabricated a custom Standing Seam Roof, installed over insulation, adjustable Z-furring and plywood at the radius light box above the building’s front curtain wall. MG McGrath Architectural Glass & Glazing also worked with the Fairview Southdale Hospital project team on the interior and exterior of the hospital’s Emergency Center renovation. On the front side of the building, facing Highway 62, MG McGrath Architectural Glass & Glazing installed Kawneer 1600 System 2 curtainwall with a clear anodized finish that radiuses inward and outward, and serpentines at the head. On the front and backside of the building, there are 40+ punched openings with curtainwall. On the interior of the facility, MG McGrath Architectural Glass & Glazing installed more curtainwall framing at the entry points, glazed multiple Stanley automatic doors and multible ICU doors, and installed integral blinds and fire rated glazing.